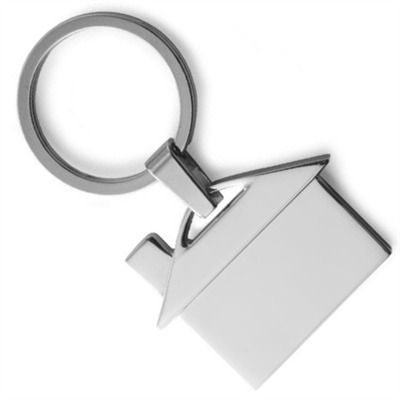 Metal House Key Rings are premium quality themed key rings. You have cookies disabled. This site won't function properly unless you enable cookies. You internet browser is out of date and is in desperate need of an update! Our site won't work properly until you do! Please click here to update. Metal House Key Rings are supplied to you already boxed in a smart black laminated card box so present well to use as a corporate gift idea when you brand the key rings with your company logo and business details on side of the metal house. These Metal House Key Rings are popular promo items that are premium quality themed key rings. This promotional product is imported directly from overseas. We need three weeks to produce this product. If you have an urgent due date we would recommend selecting a different promotional item as we can not speed up the delivery process. Minimum quantity that we will supply for this product is displayed. To receive quotes for larger quantities listed, please contact us. All pricing is subject to change without notice. All pricing assumes correct artwork will be supplied. Freight will be charged at cost. Listed colours & dimensions are approximate. To be used as a guide only. Copyright 2000-2019 Handy Imprints. All Rights Reserved.